Manchester City fans will be allowed to attend the Champions League last-16 first-leg tie at Dynamo Kiev in Ukraine after a stadium ban was reduced. Dynamo were ordered to play two games behind closed doors after racist attacks on spectators during October's game against Chelsea. Uefa has reduced the ban on appeal to one match, which was served against Maccabi Tel Aviv on 9 December. 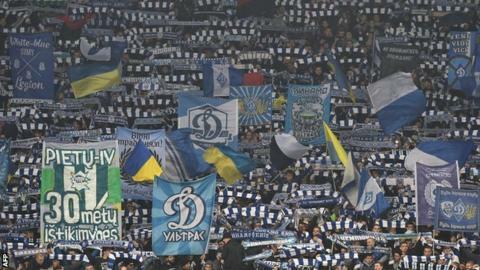 Manchester City travel to Kiev's Olimpiyskyi Stadium on 24 February. The return leg at Etihad Stadium will take place on 15 March. Uefa punished Dynamo in November after video footage showed an apparent attack on four black men at Chelsea's 0-0 draw in Ukraine on 20 October. Dynamo's fine of 100,000 euros (£76,000) has been reduced to 50,000 euros (£38,000).